I’m a manager myself for over 20 years now and I know from first-hand experience how difficult it is make decisions about learning and training. A training or a formal education (like an MBA) for an individual employee is often considered as a reward for that employee. From a business perspective it is often very difficult to judge what your return on investment will be. When you have to decide on whether or not to train a group of people this becomes even more difficult, most of the times you just don’t know. How do you decide on the validity of your investment and how to measure the outcome? As a manager this is an uncomfortable position to be in. Therefore the question is: can we resolve this? I think we can. The basis for the solution lies in skill management (be careful not to lose the ‘s’). You need to know what your employees need to be able to do and to know to make them competent. You have to assess your employees. You can do this on the job, having them assessed by their manager, or you can have a formal assessment. When you know what the competency is of your employees you can determine the gap with your ideal competent employee. You need to bridge this gap by creating learning opportunities. Sometimes the gap is clear. You introduce a new software system or a set of rules everybody needs to be trained in. Sometimes you will find gap’s that are quite common, justifying a group approach. Sometimes you will find ‘individual’ gaps that you have to solve on an individual basis. You need to set clear measurable goals for the learning outcome for the coming period. On a corporate level these goals will translate in improved scores on specific learning objectives (the learning outcome). You have to set preconditions (time, money, expected delivery dates, et cetera) per learning objective or group of learning objectives. Besides this corporate plan you will need budget for individual learning opportunities. You must demand that an individual learner will be assessed before he will get a learning opportunity and that the outcome will show what progress he has made. Make sure that you get regular reports on the progress of the learning activities. They should give you insight in the progress you made on the goals you have set and on the return on investment you get. For the rest you need to focus on facilitating the learning process. The most difficult is to create a learning culture in your company, if you have that already than you are half way. 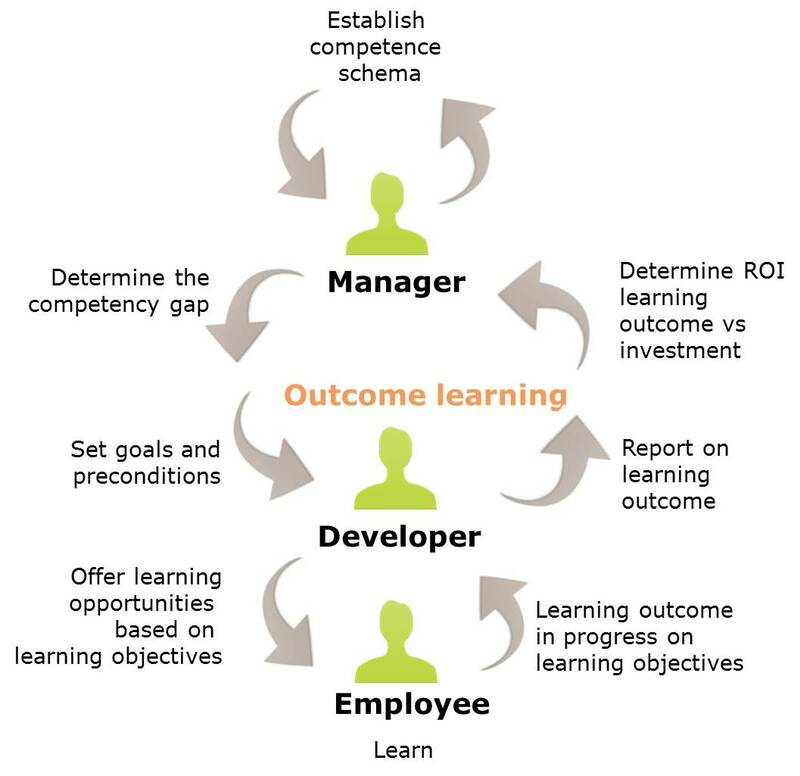 You need to facilitate the employees by offering them a learning framework that supports learning based on skills and learning objectives (especially your skills management/learning management and authoring software are important for this). Outcome learning – saving time! I call this approach outcome learning because it focuses on the result of the learning for your business. By organizing the learning better you want to improve productivity and quality at the end of the day. The use of learning objectives makes this measurable and it will improve the quality of the learning. But from a managers perspective there is an even more concrete outcome (or ROI if you want). When you base your e-learning on learning objectives, your employees will learn more in less time. They will be able to select the correct course for their learning need. And when you use the objectives in a smart way they will guide the employee to those parts of the course they need to learn. Skipping parts they don’t need by giving them an exact study advice. This will save valuable time. Learning objectives form the heart of adaptive, individual and effective (e)-Learning.